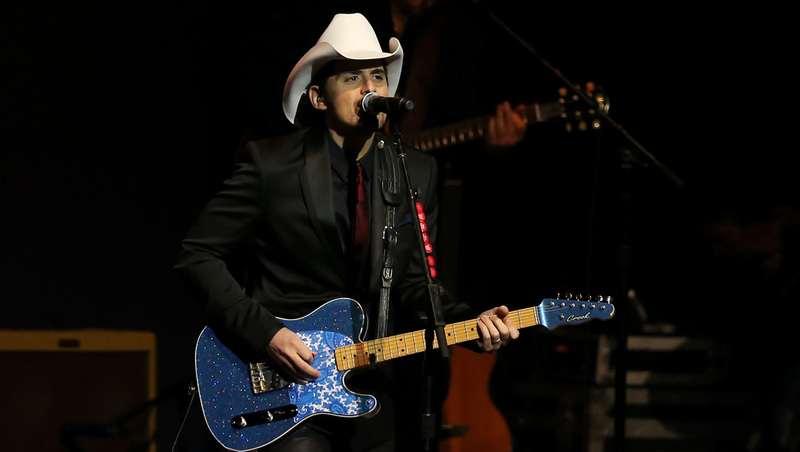 Brad Paisley is joining the list of musical acts for the 40th People's Choice Awards. Organizers from the awards show announced Friday that the country star will perform at this year's ceremony, hosted by CBS' "2 Broke Girls" stars Kat Dennings and Beth Behrs. Over the course of his career, Paisley has managed to snag three Grammy Awards, 14 Academy of Country Music Awards, 14 Country Music Association Awards and three awards from ASCAP as Country Music Songwriter/Artist of the Year. Paisley is currently riding high off the success of recent hits "Southern Comfort Zone" and "Beat This Summer." The singer-songwriter will be kicking off his "Beat This Winter" world tour on Jan. 9, in Greenville, S.C.
Other acts slated to perform at the awards show include Sara Bareilles and OneRepublic. People's Choice has revealed a new list of expected celebrity attendees, which includes Drew Barrymore, Nina Dobrev, Robert Downey Jr., Zac Efron, Anna Faris, Sarah Michelle Gellar, Sean Hayes, Allison Janney, Michael B. Jordan, Queen Latifah, Juliana Margulies, Melissa McCarthy, Shemar Moore, Norman Reedus, Ian Somerhalder, Britney Spears, Miles Teller, Justin Timberlake, Allison Williams and the cast of CBS' “The Big Bang Theory." Previously announced participants include Jessica Alba, Christina Aguilera, Sandra Bullock, Kaley Cuoco, Ellen DeGeneres, Emily Deschanel, Roma Downey, Marg Helgenberger, Josh Holloway, LL Cool J, Chris O’Donnell and Michael Weatherly. The 40th People's Choice Awards will air Wednesday, Jan. 8 at 9 p.m. ET on CBS.